How did Kordell do as a presenter? Is he someone others should consider having as a speaker? · Kordell told me more in 4 hours about advertising and gaining business than I have read or heard in the last 10 years. · The most gifted speaker I ever had the privilege of listening to. · Very informative and educational speaker. · Kordell is insightful, full of energy and will get you to look “out of the box” at yourself and your company. · He makes for an entertaining and informative speaker . . . at any chamber event. · Kordell has real world experience with presentation flair. His excellent graphics are a plus. · Dynamic, interactive, he is sure to not put you sleep and wanting you to learn more. · He will show your organization what a Chamber of Commerce is all about. · I highly recommend this motivational and “outside of the box” speaker! · Kordell is someone you want to invite as a humorous speaker. He will inspire your business to be at it’s best. · Kordell is an excellent presenter. His topics are relevant, timely, entertaining and educational. · Kordell really is a character that everyone will enjoy. · Interesting and lively with practical ideas for running any business. · Extraordinarily self confident and highly energetic. · Kordell sneaks valuable information to your organization WHILE they enjoy themselves. · I would strongly encourage you to have Kordell come to your organization to deliver a presentation that will be of great benefit to your members. · Extremely knowledgeable and energetic presenter. He would be perfect as a speaker at your next major event. 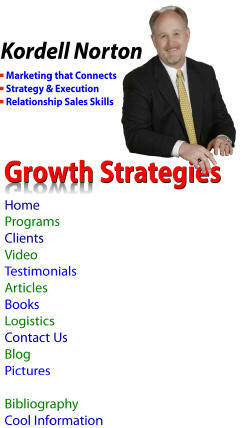 · He can move your business thinking forward, upward and to the right. · Kordell brings a bright new view of today’s customer.